As expected, Gov. Cooper on Monday endorsed a school construction bond he contends is the best strategy to begin to address more than $8 billion worth of K-12 school construction and renovation needs across North Carolina. 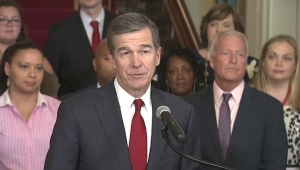 Cooper made his remarks about school construction during his State of the State address. He also called for increasing teacher pay, expansion of the Teacher Fellows program and a bigger investment in early childhood education. “We worked together to expand Pre-K to thousands more students, but we shouldn’t stop until every child has it,” Cooper said. While Democrats and Republicans agree about the need to spend more on school construction and renovations, the state’s Senate leadership prefers a pay-as-you-go strategy over a bond. Senate leaders contend the pay-as-you-go proposal will generate $6 billion for K-12, community college and UNC System building needs over a 10-year stretch while saving more than $1 billion interest payments. Cooper spoke about Wake County teacher NaShonda Cooke to illustrate the struggles of North Carolina’s teachers. Cooke, a third-generation teacher who previously worked for Durham Public Schools, has taught for 20 years. 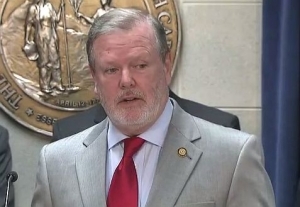 In the Republican response to the governor’s State of the State, Phil Berger painted a much rosier picture of North Carolina’s educational system, contending Republican lawmakers have made “record-breaking” investments since the GOP took control of the General Assembly in 2010. “Teachers have received pay raises for five consecutive years, and those raises were at or near the top in the country for three or those years,” Berger said. He also noted that the Republican-led General Assembly has “championed” school choice by removing the cap on charter schools and creating the Opportunity Scholarship, which provides scholarships to low-income children to attend private schools. “Every child is different and parents deserve to have the power to choose the learning environment that’s best for their kids,” Berger said. Under Republican leadership from 2011-2017, Berger said the number of North Carolina adults who earned bachelor’s degrees increased 27 percent. He said historically disadvantage groups such as African Americans have also made substantial gains under Republican control of the General Assembly. He said 17 percent more blacks earned high school diplomas during that span and the number who earned bachelor’s degrees increased by 39 percent, with that number jumping to 42 percent for black women. Cooper’s support of a school bond runs counter to the alternate pay-as-you-go plan proposed by the Senate leadership, but it’s in line with a $2 billion bond proposal endorsed by Republican House Speaker Tim Moore. Under Senate Bill 5 (SB 5), the senate’s plan, the state would use money from the State Capital and Infrastructure Fund (SCIF) to pay for school construction and renovations.